In US shampoo communications, signifers of vigorous activity unseen by the naked eye are mainstream and routine. The weakest parts of hair cuticles are targeted and fortified by Aveeno's wheat-complex formula, one ad claims; as evidence, we're shown microscopic-esque Before/After images of one such cuticle. A Vive Pro ad boasts that the product nourishes hair with royal jelly — the efficacy of which is illustrated by a Table of Elements-style honeycomb, the cells of which read "Proteins," "Omega 3 & 6," "Glucose," and so forth. Other products dive even deeper, down to the cellular level — where a shampoo's ionic, nanorobotic, or I-don't-know-whatic technology causes the cells within a single strand of hair to oscillate through rejuvenating vibrational motions. Not since Wilhelm Reich's orgone accumulator and early Cold War sci-fi has vibrational magic-science been such a popular phenomenon. One L'Oreal TV spot (here's the Japanese-dubbed version) sends viewers speeding through a hydra-collagen protein/molecule, as though we're passengers aboard the miniaturized submarine in Fantastic Voyage. (Only even smaller, since the Proteus was navigating the bloodstream.) Alas, there's no Raquel Welch along for this ride. What's next? Spooky action at a distance? Interactions between moving charges mediated by propagating deformations of an electromagnetic field? Quantum pseudo-telepathy? Maybe — but not until science fiction popularizes such concepts. However, this spring, when I saw Iron Man 2, in which Tony Stark uses a jury-rigged particle accelerator to synthesize a new element, I predicted that shampoo brands would hasten to make similar claims. 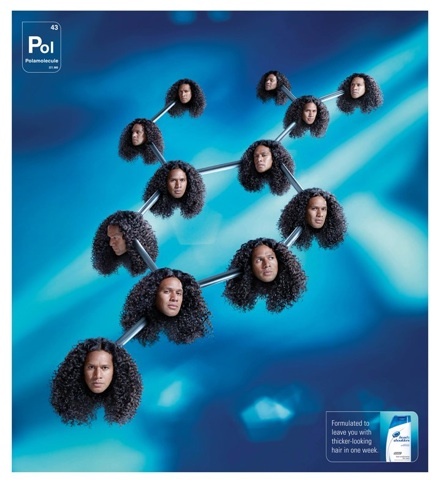 It took them a few months, but I'm pleased to report that Head & Shoulders has risen to the challenge with its latest print ad featuring Super Bowl champ Troy Polamalu. See below. OK, the Polamolecule isn't exactly a new element. But it's a step in that direction — so stay tuned! There are sure to be more molecular breakthroughs announced via shampoo communications in 2011. So far, all of the developments in hair cleaning are derived from and restricted to three dimensions, with occasional nods to the fourth in terms of a product’s effect longevity. I was as excited by the discovery of the polamolecule as the next man, but lets be honest, molecular-level discovery is all a bit ’20th century physics’ isn’t it. Its quaint and schoolboyish, the stuff of microscopes and dry ice. I wait patiently for the category to open up to the other six dimensions that simply have not been explored yet. Shampoo needs some pan-dimensional hair-folding quantum leap softnology. For a live-action look at the Polamolecule, check out this link http://www.youtube.com/watch?v=zsu-KWws29M. And as the person who discovered the Polamolecule, I want you to know it was an independent discovery not influenced by Iron Man II which I didn’t even see. Ha. Welcome, GEARFUSE readers. We’ll be looking at “soft science” a couple more times this week… Stay tuned! Who would have thought that 2010 would be the year of the nit? Dandruff cashes in on our current diversionary obsession with bacteria (did you know that there are more on an unsanitised potato chip then there are on your toilet seat), lurks on street corners biding its time, smoking cigarettes, smirking at your complacency. Ha Tommy, you are surprised I speak your language. If we let our vigilance lapse my money’s on dandruff. We’ll be begging them to bring back Vosene, which zaps nits and dandruff in one. Forget sweet soft-spoken Polamalu. Give me a benzene ring of heavily medicated Bruce Willises any day. God bless America. Malcolm, this morning I bumped into a friend who is Director of Environmental Health for the City of Cambridge (Massachusetts), and he tells me that bedbug and invisible mite reports on the rise. If one happens not to recognise Troy Polamalu, is this potentially an extremely disturbing image? May I ask you how and where does dandruff come into this, if at all? Do these little molecule guys eat dandruff, scare it off from coming near in the first place or what? Is dandruff a much bigger thing than they are or a much smaller thing? Is that blue and white background one big flake or a tiny outlying much neglected region of such a flake? In England junior school kids have a major problem nowadays with little bugs we call nits – I’m not sure if the resurgence of this is economic, environmental, a temporary metaphysical triumph of evil over good or what. 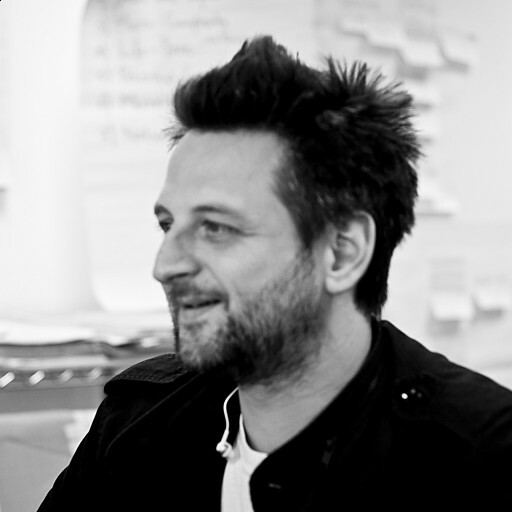 I get the feeling, looking at this picture, that even if dandruff has nothing to do with the scenario this guy would sure as hell scare the life out of nits. A bit dated compared with Iron Man 2 and vibrating hair care but this image, to me, evokes a Being John Malkovich of the nit world. Next stop must be a neuroscience conditioning system deploying authentic Chinese medicine/martial arts synergies. But it’s still a very disturbing image. PS: Head & Shoulders is all about getting thicker-looking hair now — fighting dandruff is so 2008.